Mum, Mummy, Mother, Mama. Whatever your name for her your Mum will probably deserve a medal! Instead, she get’s her very own day, Mother’s Day, which is on 31st March in 2019. Of course, Student Discount Squirrel wouldn’t leave you hanging and having to run around to splash the cash last minute. Instead, we’ve rounded up some of the best buys for this Mothering Sunday that won’t leave too much of an impact on your bank balance but don’t scrimp on saying and showing your appreciation. The home of custom cards now goes a step further and offers a range of flowers and gifts for all occasions; including, of course, Mother’s Day! As one of their busiest holidays of the year, Moonpig have loads of discount codes and money-off offers for you to apply to their products in time for Sunday. Their Mother’s Day Card range can all be personalised with your own text or photos, and sent out direct for the day if you’re not able to pass it over in person. Over 720 designs are available, so it’s really unlikely you’ll pick the same as your siblings! Upgrade your card to a giant one to really perk up her post-box and use code HAVE25OFF to get a 25% discount on larger-sized cards. There’s also a large variety of flower bouquets to choose from, including lots that are ‘letterbox-friendly’ so you don’t need to worry about her catching up with a courier or being in for the postie. 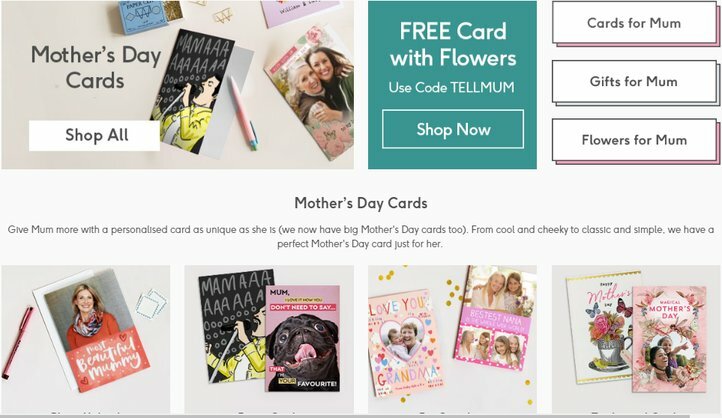 All ‘Mum’ flowers come with a free card of your choosing with the code TELLMUM at check-out. You can still personalise it as you would any other, so she’ll never know it was a freebie! Argos probably isn’t the first shop you think of when you’re considering Mother’s Day gifts, but they actually have their own Mothering Sunday gift page. Plus their sheer amount of stores it has, combined with a myriad of delivery options for those not near one, actually makes it the ideal present-buying destination! Collect in-store, including Argos branches in-city, in out-of-town retail parks and selected supermarkets and department stores. Click and Collect by buying and paying online then picking up en route (headed home? Pay online and grab it on your way, from any branch!) or take advantage of Fast Track services for same-day or next-day delivery! Few shops have the selection that Debenhams can offer, but such is the glory of being a department store! Whether it’s perfume, a handbag or something a little less stereotypical of Mother’s Day, you’re bound to find it in Debenhams. Plus there’s a handy Mother’s Day gift page with lots of great suggestions including discounts on fragrance, handbags and skincare. If your mother figure lives near a branch of Debbos, take advantage of their in-store services and buy her a massage, make-up lesson or beauty treatment at one of the many health and beauty brands. Everyone’s Mum loves Marks and Spencer, right? M&S have loads of present options for you to choose from, and you don’t need to go in-store to buy them. Flower delivery, food hampers and beauty boxes can all be purchased online, or just play it safe and grab a gift voucher so she can choose something special for herself. If the lovely lady you’re celebrating doesn’t take enough time for herself, give a thoughtful gift and make up a custom hamper of pampering products to encourage her to relax! All of Superdrug’s own brand products are entirely cruelty-free, so even the most conscientious of customers can shop easily. Pick up some face masks, bubble bath and fancy flannels – gift, sorted. It’s not the most budget of brands, but Hotel Chocolat is a beautiful premium gift for the sweet-toothed women in your life. Most of their boxes of chocs have been dressed for Mother’s Day with pretty floral designs especially for the day, but you don’t need to opt for the obvious. Mix it up with small selection boxes of her favourite treats, sign her up for the monthly tasting club, indulge in cocoa gin or vodka, or buy chocolate beauty treats! Whatever you choose to do with your Mothering Sunday, make sure you mark the day by letting those you love know how appreciated they really are. That doesn’t necessarily require a gift, but a card and a kind note can cover it all off. We’ve got you covered – and you can always check back here at Student Discount Squirrel for the very best in discounts and flash sales across all occasions! When you’re living loan payment to loan payment and have a stuffed schedule of themed society nights out, mate’s birthday parties and endless lectures, it can seem like every other weekend is some kind of Hallmark holiday requiring yet more spend on cards, gifts and trips around. Of course, realistically, you don’t need to celebrate EVERY ‘national day’ that comes along, and only some of them are actually special holidays. But here at Student Discount Squirrel, we do think that Mother’s Day is one of those occasions. After all, most of us have a marvellous matriarch in our life in some way, shape, or form, and she’s no doubt at home worrying constantly about your being away at university… even if she knows you’re totally fine there and loving your new life! Take a few minutes to mark Mother’s Day and let your mother figure know how much she means to you; be that a Mum, Grandma, Great Grandma, Aunt, Sister, Adoptive Mum, Foster Mum, Mate or Carer. And if you know anyone that’s just become a Mum, why not send them a card, note, or quick text too? It’ll brighten their day and make them smile; for very little effort and very little spend.